Since the early days of sailing, quarterboard signs have been used to both identify a vessel and adorn it with personalized style. While quarterboard signs continue to adorn ships of all sizes today, they are also used to add character to stores, restaurants and even homes. 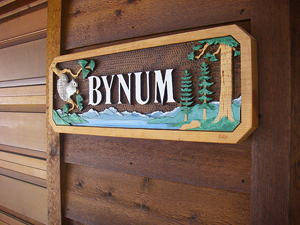 Our quarterboard signs are hand carved, sculpted and painted to your specifications, creating a uniquely personal sign with unmatched charm. Made from high-density urethane (HDU), these signs offer the look and feel of wood, but provide durability in any environment. Stake a claim to your own quarterboard sign today. Just give us a call to get started.